By Dave Winer on Tuesday, March 27, 2012 at 10:06 AM. It's not quite an explosion yet, but there do seem to be a lot of new blogging tools popping up this spring. And thankfully they all seem to be supporting RSS. I've been pretty quiet about my own new blogging tool, called Radio2. But I've been using it, as have a handful of others. You can install it on your own server, on EC2 or Rackspace, or a spare laptop in your living room. It's a content authoring system, the hits come into your feed, which is stored in S3. It's really rational technology for 2012, and beyond. Along with Radio2, I created a new namespace for features that weren't in RSS 2.0 when it was completed almost eight years ago in 2002. It's called the "microblog" namespace. It understands full links vs shortened links. It defines a calendar-structured archive, so you can store all your posts in RSS format. This has been a long-standing problem, and this solution really works. There's a provision for including a readcount with each item. I want to address two other long-standing issues: feed-is-finished for special event feeds (e.g. a feed for the Olympics, which will stop updating shortly after the Olympics is over) and feed-has-moved for redirection. If you know of other long-standing needs, I may try to address them in this namespace. If not, you can of course define your own namespaces. 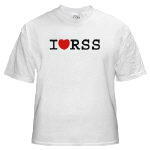 RSS 2.0 is fully open that way. PS: Here's what my linkblog feed looks like. It implements the microblog namespace, of course, as well as the RSS 2.0 <cloud> element. © Copyright 1997-2012 Dave Winer. Last update: Tuesday, March 27, 2012 at 10:19 AM Eastern. Last build: 3/31/2012; 10:37:11 AM. "It's even worse than it appears."